President Biya don write for share e concern wit French president as Notre Dame Cathedral for France burn, but kontri pipo di mock am for social media. 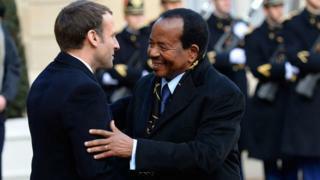 "Ah hear about de fire weh e burn down Notre Dame Cathedral, weh na historic building na place weh deh di visit plenti for Paris," President Biya write for Emmanuel Macron, French President. "Afta dis fire ah wan tell Conference for Bishops dem and for French pipo ma feelings," di Cameroon president tok. Some kontri for social media say e for surprise dem if President Biya no bi write, as deh bi di wait for e message since. Oda kontri pipo say dia president forget launch donations for build de cathedral and some say deh nova see any French pesin cough with all de fire weh e di happen for Cameroon. Deh tok about problems for Far and for Northwest and Southwest weh president no cough. Some say make e go wipe tears for French president but odas, say e don late as Makky Sall and Alassane Ouatara bin don already send dia own message. Some say Biya na good man and na e suppose put hand for pocket contribute. Fire bin burn di famous cathedral for Paris on Monday, and dem don begin contribute moni to take rebuild am.